Hey all, sorry for the late review on this title. I had a bunch of personal and life issues recently that dominated a good deal of my time. Thank you everyone who read my last review and an extra thanks to those that left a comment. 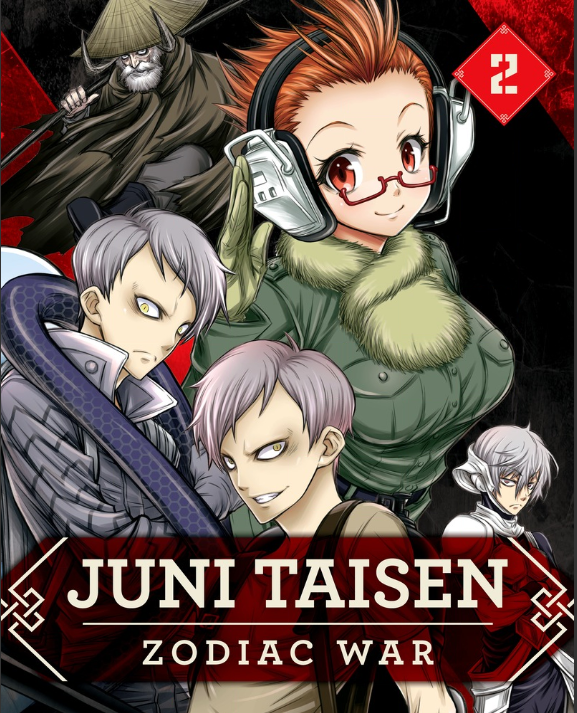 Really appreciate it, and now on to volume 2 of Juni Taisen! Every twelve years, a dozen assassins and killers take on the names of the zodiac. In a battle royale setting, they fight until there is only one survivor using any weapons or special abilities along with their wits and fighting styles. The winner and sole survivor is granted one wish with no limitation. This is the tale of the twelfth Zodiac War. The story picks up where it last left off with Rat and Chicken meeting and heading into the sewers to meet Monkey. Leaving awkwardly, Chicken is left with an odd impression of Monkey, even more so when she encounters Ox asking for the location of other warriors. Meanwhile, Monkey and Rat have an interesting conversation of why Monkey talking to Chicken actually made her weaker and that ending wars makes people lazy. Also an evident waste of time as they’re all idiots if you believe his point of view. Eventually both are forced to the surface where they encounter Rabbit and the headless Snake. Monkey tells Rat that they should subdue their enemies and not kill them, causing Rat to mention that Monkey chooses this option every time, confusing Monkey as Snake charges ahead into both of them and then past them. Rat leaves Monkey and Rat to fight in single combat. Elsewhere, Sheep reflects on his younger self including the time that he won the last Zodiac war. He speaks with his grandson, arguing against his joining of the Zodiac war at his advanced age. Sheep points out though that it’s his very age that gives him an advantage over the others, a large explosive that he intended to use to kill everyone before the competition could begin. Stuck now with everyone having survived the initial blast he thinks of who to ally himself, discarding Rat and Tiger as weaker warriors than himself. He continues to muse his options before running into a very drunken Tiger and ends the second volume with Sheep and Tiger beginning their fight. Oddly enough this volume, didn’t have nearly as much interaction with the third party observer as it did in the previous edition. Which I found actual refreshing since it didn’t cause a break in the action. That said, the series is still missing a great deal of the background that I missed from the show. Making each warrior a rather two dimensional character while in the show they had far more characterization and motivation for the things that they do. Except oddly enough for Sheep, who has by far gotten the most background information snuck into any of the volumes yet. The fights are also suffering from a bit of disjointed action. It’s getting a little bit difficult to tell, even over multiple panels, what exactly is happening in any given scene and usually I didn’t even find out what actually happened until I flipped a page. Rather than having the “Oh Wow, that was so cool effect,” it instead left me with a “oh…okay?” and I continued on skimming until the fight ended or some dialogue showed up to let me know what happened. Those of you that have seen the show know what’s coming up next, and for those of you that haven’t, well let’s just say that things get weird from this point forward.